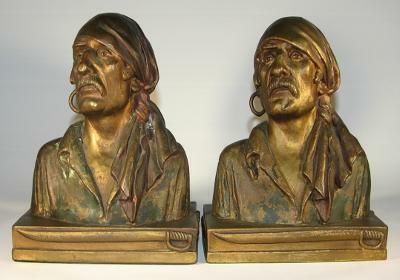 “Buccaneer” – Pompeian Bronze, circa prior to 1922. Bronze-clad. 7” high x 6-1/4” wide, polychrome with most paint worn off. Wonderful detail. Pompeian paper label attached to felt. Inscribed © Paul Herzel. Condition fair. This was produced as late as 1965 by Marion Bronze who purchased the mold in 1922 from Pompeian. Armor Bronze also produced “Buccaneer in 1928. This is the oldest and rarest Buccaneer originally sculpted by Paul Herzel for Pompeian. To purchase or inquire, contact us by phone or email with the item # to arrange shipping method and payment.